Community organizations across the country are encouraged to ring their bells 100 times at dusk to commemorate the end of the First World War. One hundred years ago Sunday, bells rang out across Europe to signal the end of the First World War. And at dusk on Remembrance Day, the bells will ring once again. As the sun begins to set, bells in city halls and places of worship, and on military bases and naval vessels across Canada will ring 100 times to commemorate 100 years since the end of the First World War. "It also signifies all those men and women that sacrificed, not just from the First World War but those that are out there today," said Chad Wagner, executive director of the Royal Canadian Legion in Saskatchewan. The bell ringing is part of a legion initiative called Bells of Peace. 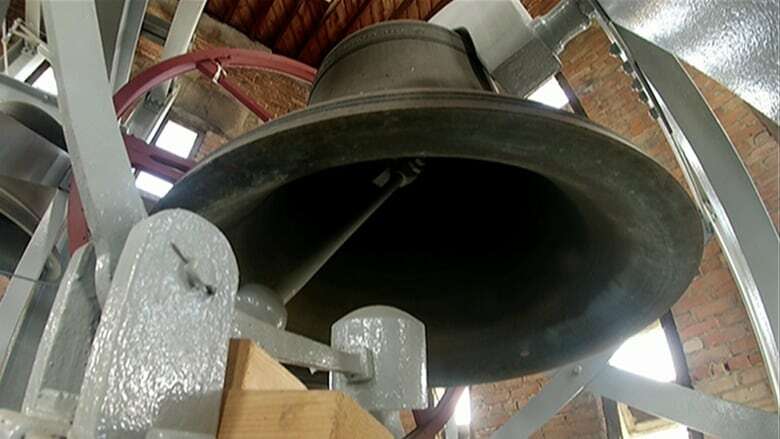 Bells are scheduled to start ringing at 5:17 p.m. CST in Saskatchewan and are expected to ring for a little over eight minutes. During that time, Wagner hopes people "just stop and reflect on the freedoms that they're able to enjoy today," he said. "The fact that their children are able to go play soccer in the fields, or they're able to watch that football game on TV or attend the game themselves. The freedom that we're able to enjoy today is because of the sacrifices [of] the men and women of our nation." Community organizations are invited to participate, ringing their bells or playing a recording of a bell 100 times, at five-second intervals. Additional information can be found on the Bells of Peace website. With files from CBC Radio's Afternoon Edition.